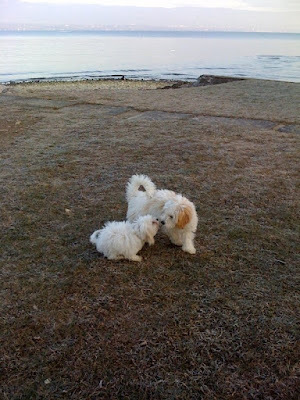 Daphne was the smallest of the litter, and Obelix the biggest. They met today for the first time since leaving their mum and had a great time. She is less than half the size of Obelix but gave as good as she got. After our wee adventure yesterday, where we got lost in the woods of France, she is not so keen to go out for a long walk today. We walked for over an hour before I remembered my trusty iPhone has GPS navigation system that lead us back home safely. It was a beautiful day but very cold and Daphne was not impressed. Today I am meeting the American Womens’ Club walking group for a walk in this area. I must remember to take my camera. The weather is beautiful again today, but still bitter cold.